["The wall walling Paris in, makes Parisians wail"
In 1783 work was begun on the " Wall of the Fermiers généraux", a customs barrier around Paris, which by 1789 had become one of the most hated symbols of royal "despotism". Tolls on goods entering the city, which formed part of the Ferme générale, were reckoned to represent 28 to 30 million livres in royal revenue. Evasion was widespread and the growth of the suburbs had resulted in numerous anomalies of jurisdiction. It was high time for an enlightened administration to create a rational and effective new barrier...The scheme, the brainchild of the chemist and tax-farmer, Antoine Lavoisier, was taken up by Calonne when he became Controlleur général in 1783. Plans were submitted in February 1784 and royal approval received in January 1785, but it would seem work had begun as early as 1783. A twenty-four kilometre-long concentric wall was planned, with traffic into the city controlled via 54 gates. The wall was to run well outside the built-up areas of the city and to encompass a good deal of terrain formerly free of taxes, notably faubourgs Saint-Victor, Saint-Marcel, Saints-Jacques on the Left Bank and the villages of Chaillot and Passy on the Right. Almost immediately there were outcries of protest. The idea of a wall seemed anachronistic to many: there were complaints that Parisians would be denied the sight of green fields; one pamphleteer even calculated the exact volume of air they would be deprived. Different interest groups assailed the Conseil royale, which replied only that the new customs barrier was in the interests of Paris's "happiness and pleasure". Resentment was most bitter among the ordinary population of Paris. Dues fell heavily on basic staples: wine and beverages, livestock ("le pied fourché") straw, wood, coal, dried fruit, cooked meats and poultry. Working people did not relish the idea of paying more for their drinks in the guinguettes, which clustered particularly in districts like la Courtille, up until now outside the customs zone. Taxation could double the price of le petit vin. Small wonder that the wall was perceived as testament to royal rapacity and as an insult to the misère of the people. The architect Nicolas Ledoux, who had worked with Lavoisier on the salt works of Arc-et-Senans, was commissioned to build a new centralised "Hôtel des Fermes" near the Halle au Blé and then to construct the customs posts themselves. The barrières were to prove his most ambitious and costly project. Customs houses should of course be symbols of authority and there was even a suggestion that they should serve as landmarks to the entrances of the city. But Ledoux's vision stretched well beyond the practical into the realms of neoclassical utopia. He and Calonne referred to them as "Propylées" in allusion to the monumental gateway of the Athenian acropolis. Each road into the city was to be guarded by a single large or two smaller pavilions, each of them different in style and reflecting an impressive range of architectural idiom. Ledoux also intended to adorn his posts with sculptural personifications of the main provincial towns that lay ahead of the traveller, though only a few of these statues were ever completed. Barrière d'Enfers (two small pavilions, place Denfert Rochereau). As soon as they appeared, Ledoux's pavilions and columns were reviled for their architectural excess. 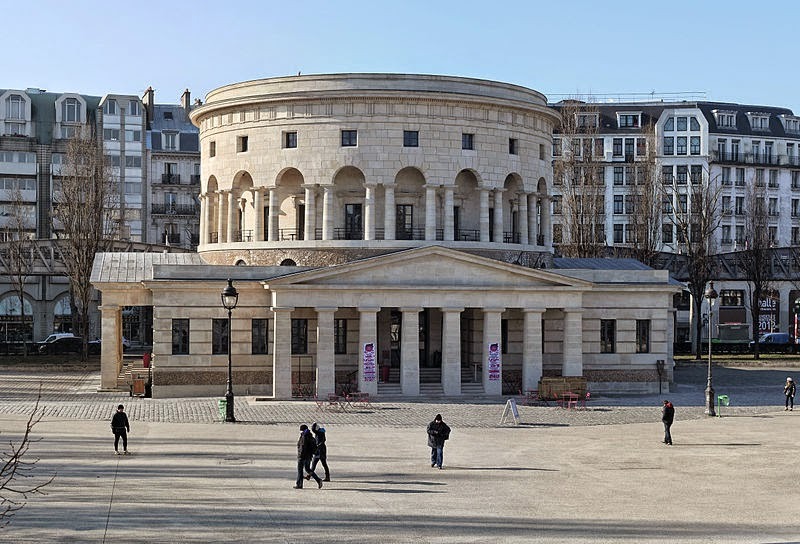 In 1784 William Beckford commented that Ledoux would be marked as "the very prince of pomposity and ponderosity" for his customs houses, which looked more like the entrances to a necropolis than a living city (see Braham, p.193-4 ) According to Mémoires secrètes of October 1785, they were monuments to despotism. In 1787, with the fall of Calonne, work was suspended and the accounts examined; it was reported that the venture had cost a colossal seventeen million livres. Necker dismissed Ledoux and appointed J.D. Antoine et J.A.Raymond in his place. The wall was still under construction at the start of the Revolution. In the uncertainty of early July 1789 crowds gathered at the barriers and used force in an effort to get foodstuffs through without paying duty. On July 8th the prince de Lambesc, commanding officer of the Royal-Allemand regiment, was obliged to send his cavalrymen to to protect the customs officers and force carriers to pay. The dismissal of Necker on 12th July heralded a day of unrest in the city, followed by concerted attacks on the customs posts. The burning went on all day although rioters called a halt when the fire threatened to spread to nearby houses. At the subsequent enquiry, between 29th March and 29th April 1790, 81 witnesses were heard. They gave evidence about the burning of thirty-one of the customs posts. Among the incendiaries were "a few well-dressed persons" but these were mainly adventurers or spectators such as the man "in a blue coat carrying a gold-headed stick" or another "riding a white horse". The great mass, however, were working people. Of the eighty rioters arrested fifteen were "professional" smugglers, fifteen wine-merchants and five self-employed artisans; the rest were coopers (Monmartre), weavers (in La Rapée), porters and unemployed workers who had been given jobs at the charity workshop of the Saint-Martin barrière. As Rudé concludes, many workers were convinced that the destruction of the customs posts would bring about a lowering of prices. At the same time crowds attacked buildings, such as the monastery of Saint-Lazare, where they believed food to be hoarded. Richard Clay has made a particular study of the attack on the barrière de la Conférence on the road coming into Paris from Versailles, a post which was adorned with free-standing statues representing the two northwestern provinces of Normandy and Brittany. These statues were systematically set upon and decapitated, so that henceforth they declared to people entering Paris from Versailles that "royalist France is a body politic without a head". Perhaps Dr Clay overstates his case, but the intensity of this attack on the symbols of power was certainly a clear expression of the intense animosity felt by the ordinary population. The people did not immediately get their way, for in June 1790 a decree of the Constituent Assembly put the barriers into service. In the following year, however, all customs dues at the entry to towns were abolished and, amid scenes of much rejoicing, all work on the barriers was suspended. The respite was to be only temporary; internal customs - and with them the use of the wall - was once again reimposed in 1798. 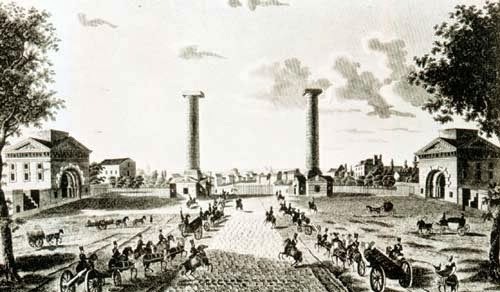 Elphège Frémy, "L'enceinte de Paris construite par les fermiers généraux et la perception des droits d'octroi de la ville (1784-1791)", Bulletin de la Société de l'histoire de Paris et de l'Ile-de-France(1912) p.115-48. Geneviève Lafrance, « Liberté, Égalité, Ébriété », article in COnTEXTES [online journal] 6th september 2009. Richard Clay, "Signs of power: iconoclasm in Paris, 1789-95" DPhil. thesis, University of London, Sept.1999. Hello Richard. The pamphlet is referred to on p.120 of the article by Elphège Frémy that I list. It is: Jacques-Antoine Dulaure, Réclamation d'un citoyen contre la nouvelle enceinte de Paris élevée par les fermiers généraux (1789). There are more details about it on the internet though not (as far as I can see) an e-text. Looks like most of the copies of the pamphlet were seized by the police and destroyed.